In November 2016, the European Commission proposed the Clean Energy for All Europeans package, which included two proposals for a review of the Energy Efficiency Directive (EED) and Energy Performance of Buildings Directive (EPBD), as well as a proposal for the governance 2030 regulation. The agreement on such proposals is done through the codecision procedure which is a legislative process involving the European Commission, the European Parliament and the Council (Member States). Council’s most recent discussions concerning the proposals are significantly lowering their ambition and their positive impact on growth and job creation. 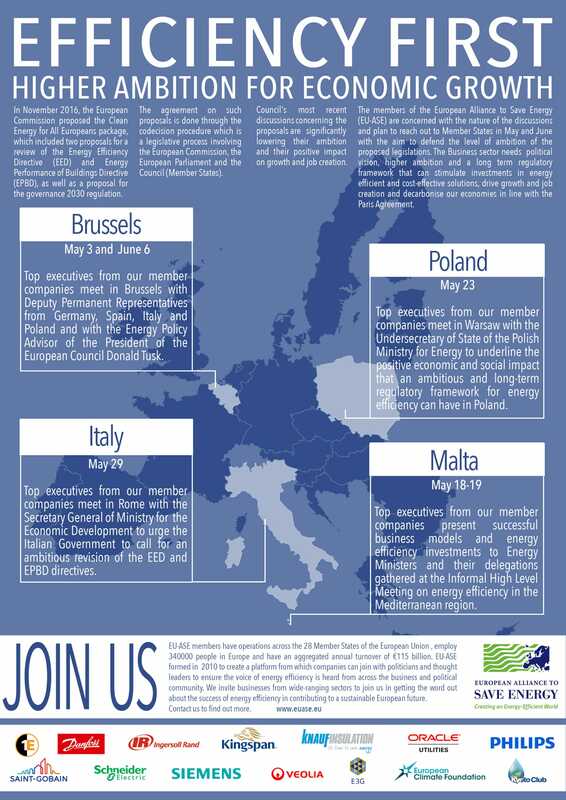 The members of the European Alliance to Save Energy (EU-ASE) are concerned with the nature of the discussions and plan to reach out to Member States in May and June with the aim to defend the level of ambition of the proposed legislations. The Business sector needs political vision, higher ambition and a long term regulatory framework that can stimulate investments in energy efficient and cost-effective solutions, drive growth and job creation and decarbonise our economies in line with the Paris Agreement.